Ah, romance  wherefore art thou? Ending your days in a dank Roman prison cell might seem a far cry from the happy, sappy holiday of today, second in popularity around the world only to New Years. But by the Middle Ages, Valentines Day was recognized as one to honor love. Just as no one can say for certain what the origins of the holiday are, no one can tell you when chocolate, flowers and frilly heart-shaped cards came into it, either. But what the heck  who could say no to roses, sweets and thou? No matter, Thursday is a day to celebrate love in all its forms, whether its thanking your mother, romancing your sweetheart or pledging loyalty to your best friend. Not that were not loving people all the time, but its a day to shine in that way, to be silly in love, said wedding planner Mandy Winn. Winn, who owns Celebrations Event Productions, counts Valentines Day as the last gasp of the engagement season, which begins at Thanksgiving. About 70 percent of engagements occur in those 12 weeks. Thats actually a rare thing when it comes to purchasing that de rigueur Valentines Day gift, chocolates. 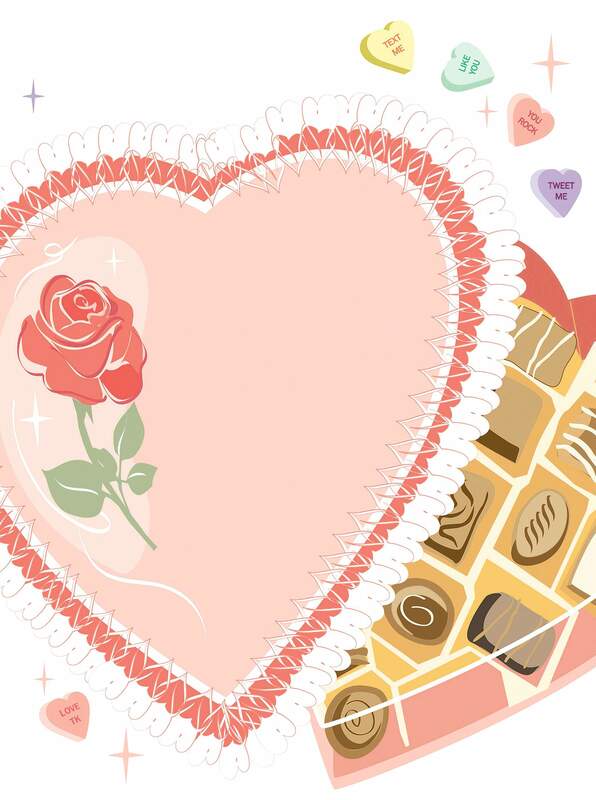 Her best-sellers are truffles, chocolate-dipped strawberries and pre-made heart-shaped boxes. And while men still make up a majority of the buyers that day, plenty of women come in, too. A word to the wise  the strawberries are good only for a day. If youre looking for something saucier than your average raspberry truffle, Aprils Garden offers chocolate gourmet popcorn in flavors like blisters on her butter crunch, mutton-bustin milk chocolate and have bacon will travel. Bacons possibilities as an aphrodisiac seem to know no bounds. For the tried and true, however, Aprils Garden also sells roses, and red ones are still the hands-down favorite on Valentines Day. If your beloved is a sweet hound to boot, you can include pink champagne truffles or heart-shaped petit fours. Sometimes its the simple things that carry the day. Liz Mora, executive director of the Womens Resource Center, romances her husband, Roland, with the biggest bag of Reeses mini peanut butter cups she can find. They are his absolute favorites. For herself, she buys Doves chocolates. Yet you neednt throw in the towel on romance because children fill the picture frame or dinner out isnt a possibility. Eric Allen says the most memorable Valentines of his life was the first one he spent with his now-wife Ruby. They shared an intimate home-cooked dinner a deux, with champagne. To round out dinner at home without spoiling the mood from over exertion, you could pick up a chocolate decadence cake, a flourless 6-inch torte from Serious Delights bakery or individual chocolate mousses. But for some, the most romantic thing of all is a loving gesture expressed any ol time  a surprise, if you will. Amy Wendland, a local artist and college professor, is just such a person. She lived in the down-on-its-heels neighborhood of Hennepin in Minneapolis before moving to Durango, where she met and married her sweetheart, Mike Smedley. But still, she pined for a talisman of good times from her old neighborhood, a concrete garden statue of a running boar. So I thought, Lets get one, said Smedley, a Durango Herald columnist and Bank of the San Juans executive. He searched for it on Google, enlisted a friends help and found out that the fleet-footed pig was none other than the University of Arkansas mascot and easily obtainable. A week later, a box larger than your average microwave arrived at the office. He was going to save it for a special moment, but he couldnt help himself. He led his wife into his office and revealed the porcine statue. She gasped and grinned and uttered words of delight  Where did you get that? I cant believe you did that. They named it Hennepin von Schnitzel and placed it on the backyard deck. OK, it wasnt Valentines Day, but it was a great gift.